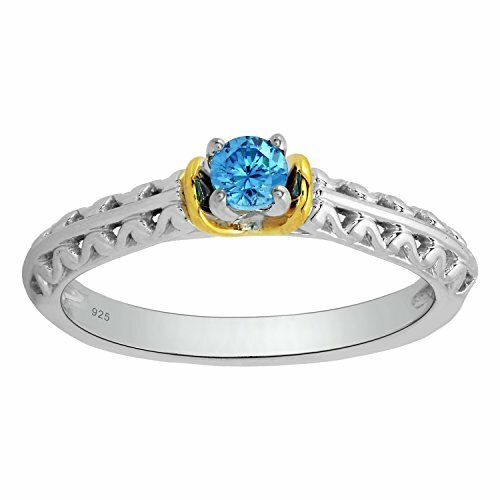 Diamond of RD Blue color I3 clarity with embedded in prong set. "Promise rings" A promise ring is a symbol of commitment and is often seen as a pre-engagement ring. However, it can be given for many different reasons -- as a symbol of chastity, loyalty, monogamy, friendship, or even a promise to oneself to stay clean and sober. Make any occasion a special occasion with this 925 sterling silver classic shaped promise round center blue stone diamond ring. Ring size is 7. FREE magnetic strip gift box included. Our sense of responsibility to the larger community has inspired us to become active members of the Kimberley Process Certification and reemphasize our commitment to using conflict-free diamonds. We are also an active member of RJC (Responsible Jewellery Council). Genuine 1/5cttw White Diamonds - Carat Weight listed is the total for all diamonds - Diamond Hub has applied stringent policies and confirms that we comply with the Kimberly Process to ensure all our diamonds are conflict free. Sterling Silver with Yellow Plate Promise Ring. Promise Ring Jewelry, Promise Ring. Solid 925 Sterling Silver, Authenticated with a 925 Stamp. If you have any questions about this product by Genuine Diamonds by Diamante, contact us by completing and submitting the form below. If you are looking for a specif part number, please include it with your message.